How to get to Neuschwanstein Castle Germany? Find tips about public transport and Neuschwanstein tours. More than one million visitors per year visit Neuschwanstein. 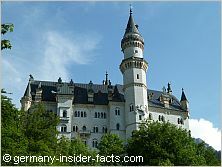 King Ludwig's dream castle is one of the biggest tourist attractions in Germany. For many travellers a visit is a dream come true. The stunning location of the castle, the eccentric architecture, the beauty of the surrounding landscapes, and the majestic Alps as a backdrop of the castle add up to make Neuschwanstein the huge visitor attraction that it is. The beauty of Neuschwanstein is touching and captivating. I am convinced, the castle is going to facinate you as well. Are you ready to visit? Let me answer your questions, I know you have them. * Is it best to go on my own? * What's the advantage of joining a tour? * How much walking is necessary to get to the castle? * Is it worth to stay a couple of days in the immediate vicinity of the castle? * What is the closest town? * Can I visit the castle by public transport? Facts you should know How to get there? Public Transport Tours from Munich Where to stay? News & Restrictions - Check out if restoration work or any closures might affect your visit. Despite the fact that Neuschwanstein and Hohenschwangau Castles are busy places, a visit can be most enjoyable when you take your time. Walk around before or after your tour of the interior, and enjoy the stunning views and beautiful landscape. For many visitors it is a highlight to see Neuschwanstein Castle, even if only from the outside. You can walk up to Marienbrücke for the most stunning views and photo opportunities. With more than 1 million visitors per year, about 6,000 on busy summer days, Neuschwanstein can be a crowded place. July, August and September are the most busiest months. You are not allowed to take photos and videos inside Neuschwanstein castle. Remember that the palace building has 5 floors, so you'll have to go 165 steps upstairs, and 180 steps downstairs. Opening times: The Neuschwanstein Castle is open daily except Christmas Eve (24.12. ), Christmas Day (25.12. ), New Years Eve (31.12.) and New Years Day (01.01.). Ticket sales: From 8am to 5pm (April - September) 9am to 3pm (October - March). Please note: During the castle concerts week in September the ticket centre closes 30 minutes earlier. Guided tours inside the castle take about 30 to 35 minutes, and are well organised. Some people are happy with that, others feel rushed. You can only visit the interior of the castle on a guided tour, operated by castle staff. Tickets are only available at the ticket centre in Hohenschwangau or online on their website for a small reservation fee.. Whether you buy tickets in the ticket centre in Hohenschwangau, or online, they are only valid for the tour stated on the ticket. The ticket shows the exact time and tour number, so be there in time and don't miss your tour. Be aware that there might be long queues on the ticket counter to collect the ticket. Online reservations have to be made until 3 pm the day before your visit at the latest. You can enter a desired entrance time when you book. 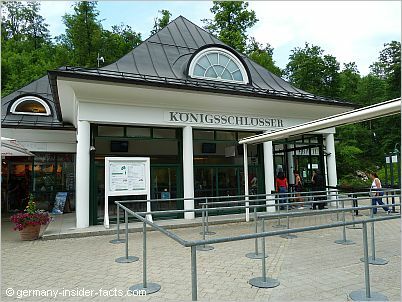 There is a separate counter at the ticket centre in Hohenschwangau to collect reserved tickets. Regular ticket price is 12 € for Neuschwanstein, 12 € for Hohenschwangau, or 23 € for the King ticket to see both castles within one day. Guided tours are held in German and English, for other languages audio guides are available. 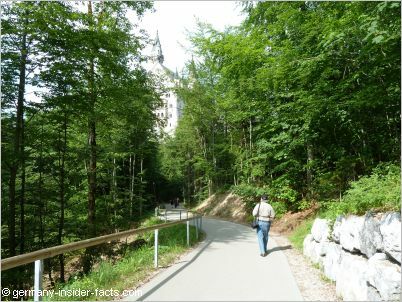 Once you arrive in Hohenschwangau you have several options to get up to the castle. Walk: Depending on where you start in the village, a walk up to the castle takes about 30 to 50 minutes. From the ticket centre it is about 1.5km uphill on the paved Neuschwansteinstrasse. 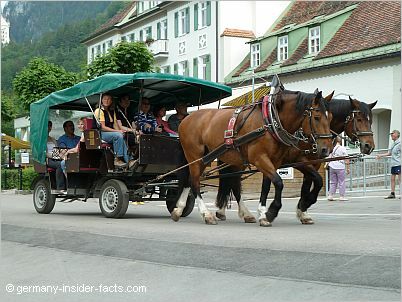 Horse-drawn carriage: Departure point is in front of hotel Müller in Hohenschwangau. Tickets cost 6 € uphill and 3 € for the downhill journey. It is quite fun to use the horse carriage. The carriage stops just below of the Schlossrestaurant and hotel. From here it is a short walk of about 300m up to the castle entrance. Bus: The bus service starts in front of Schlosshotel Lisl and takes you to the "Jugend" lookout / Marienbrücke. Enjoy the stunning views to Neuschwanstein & to the Pöllat Gorge before you walk down to the castle. The 600m path is paved but very steep. The sign at the bus station says the walk is not suitable for the disabled. On the walk downhill you'll get a beautiful view over Hohenschwangau castle, the village, and to the Alpsee & Schwansee. Ticket costs 1.80 € uphill, 1 € downhill. The buses don't run when there is ice or snow. Dogs are not allowed on the bus and in the castle. Check out this handy Hohenschwangau map! When you stay overnight at the Schlossrestaurant Hotel you will get permission to drive up to the hotel. Marienbrücke is often closed in winter due to snow and ice. The bus to Marienbrücke doesn't operate in wintry conditions either. 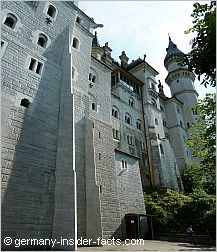 Visitors can still use the footpath or the horse carriage from Hohenschwangau to reach Neuschwanstein castle. The hiking trail through Pöllat gorge is closed until further notice due to rock falls. The gateway building at Schloss Neuschwanstein is scaffolded until summer 2018. I know it is unpleasant when you visit a historic site and see it scaffolded, but renovation work has to be done every now and then to preserve the old buildings. 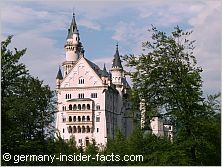 Disclosure: germany-insider-facts.com is not a tour operator. I research useful tours to help you plan your trip. So, tour links below are affiliate links. This means when you book a tour through one of these links, I earn a small commission (there is no extra cost for you). This money helps me to maintain this website and provide the free information. When a tour suits you, you make the booking on the provider's platform. Be sure to read all details before you book. I appreciate your feedback, good or bad experiences with a tour. Thank you for your support. These tours from Munich are great when you don't have your own car, and don't want to figure out yourself how to go by train to Neuschwanstein castle. As the guided tours inside the castles are operated by castle staff, they are are not included in these packages. However, the big advantage, when you book a guided tour from Munich, is that your tour guide will take care of the tickets. 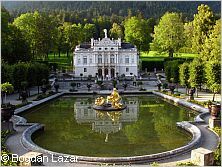 Apart from the first tour listed below, you have the chance to also see Linderhof Castle, a fact many travellers appreciate. If you want a train ride but don't want to care for train tickets and avoid lining up for your castle ticket this is the right tour for you. Your tour guide gives you interesting information about King Ludwig II and Neuschwanstein castle while you are on the train. You'll be also shown the best vantage spots and the waterfall gorge at the castle. The coach takes you back to Munich where you arrive at approximately 7 pm. Take the opportunity to visit Neuschwanstein Castle and Linderhof Castle in one day. 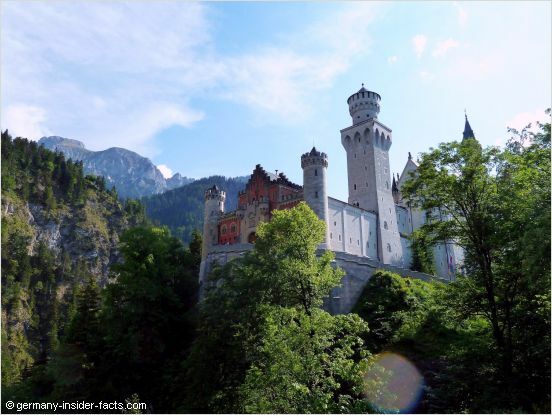 Travel by air-conditioned coach from Munich to Linderhof, have a short stop in Oberammergau, and finally 4 hours to explore Neuschwanstein and join the optional tour inside the castle. Your tour guide gives you tips and the necessary information to make the most out of this long day. How to get to Hohenschwangau by public transport? From Munich there is a train and bus connection to Fussen about every hour. It is a nice journey (2 1/2 hours) through the lovely countryside of the Allgäu. Make sure that you catch the direct train to Füssen which runs every 2 hours (07:50 and 09:50), otherwise you have to change trains additionally in Buchloe or Bissenhofen. In Fussen take either Bus 73 to Steingaden Feuerwehrhaus or Bus 78 to Tegelbergbahn, Schwangau. The bus stop is called Hohenschwangau, Schlösser. 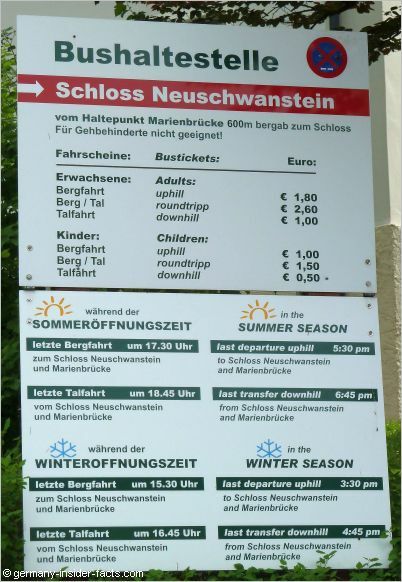 The regular fee is about 58 € for a return ticket from Munich (bus included). You can purchase the Bayern-Ticket online or at ticket machines. When you buy tickets on the DB counter they cost 2 € more. The Bavaria ticket is valid from 9am to 3am the next day on all regional trains and most busses (not on ICE & IC train). Please note: There is no seat reservation on regional trains and busses. Older trains and buses might not be air-conditioned. Discover why Ludwig II was fascinated by this area in southern Bavaria. Take your time and stay a while when you visit Neuschwanstein castle. Now I hopefully made you long to visit Germany's fairy-tale castle? Here is more info for you!